Feel like you have traveled back in time at the Great Gatsby Festival & Gatsby Tea and Fashion Show at Tallac Historic Site August 10–11, 2013. 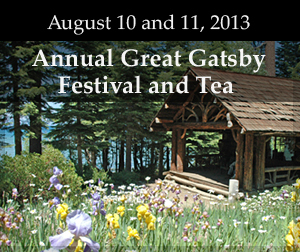 Join other Gatsby enthusiasts at the Tallac Historic Site the second weekend in August! Prepare for a weekend full of many wonderful activities. Take a stroll on the Pope the Baldwin estates among wandering musicians and jugglers, enjoy face painting for children and adults alike, participate in a raffle, purchase period-appropriate items, check out the vintage car shows, and get your annual Gatsby poster. The Gatsby Festival goes from 10:00 AM to 4:00 PM and admission is free. The Gatsby Tea and Fashion Show is a 1920s high tea with sweets and savories, plus bootleg champagne. The fashion show will be put on by Sherrie Oliver under the theme “The Life and Times of Jay Gatsby.” It will feature book characters displaying fashions of the 1920s as Sherrie reads short passages from the book about each one. The Gatsby Tea and Fashion Show takes place August 11, 2013, from 2:00 PM to 4:00 PM on the Valhalla Lawn. Tickets are $50 per person or are offered at group or table rates. For ticket info, download the order form here.